Scores of swimmers are set to take to the choppy waters off Malin Head for an annual charity dip, now in its eleventh year. This summer’s ‘Saddle Rock Swim’, set for Sunday, August 17 next, will see competitors complete the one-mile distance from Saddle Rock to Port Mor Pier to raise money for Foyle Search and Rescue. Through the years the Inishowen aquatic event has already raised around €15,000 for various good causes and organisers are now hopeful of boosting the Derry-based voluntary group by upwards of €1,000. “We selected Foyle Search and Rescue this year because the charity and its volunteers have a huge responsibility, patrolling one of the most dangerous and fastest flowing rivers in Europe,” said Colm Kelly. “Foyle Search and Rescue has grown to become a huge source of comfort to many – not only in searching for those who are missing but more importantly by saving lives in preventing others from entering the river,” he added. Those taking part in Sunday week’s swim could be in for a once-in-a-lifetime experience with schools of dolphins active in the area. 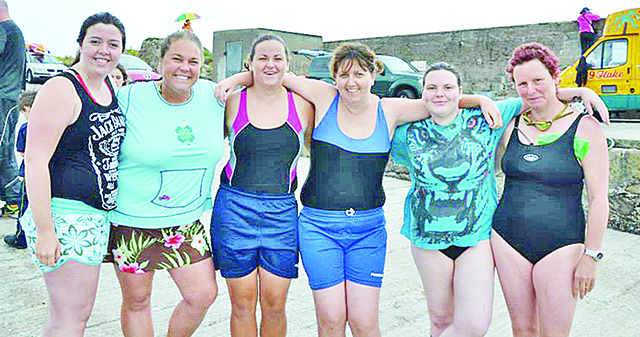 A recent swim in Moville saw competitors joined by the friendly fish, who welcome human contact. “It would be great to have the opportunity to swim with Dolphins,” Colm smiled.